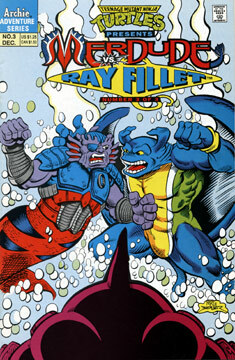 The issue opens with Ray Fillet attacking Merdude! As it turns out, a criminal worm-like alien named Bloho was banished from his galaxy and wound up appearing in the Earth’s ocean, near where Ray Fillet was having a conversation with Merdude in his sandy castle beneath the sea. Bloho is able to possess whatever creature he attaches himself to – so he attached himself to Ray Fillet and promptly attacked Merdude. As the two friends battle, Armaggon arrives on the scene. The villain waits to see how the fight turns out, deciding he’ll take care of the winner after the battle has finished. Eventually Ray knocks out Merdude, and Armaggon zooms in for the kill. The shark is surprised to see Bloho attached to Ray Fillet, and the worm mouths off to the toothy villain. Armaggon snarls and clobbers Bloho with one punch, and the worm floats unconscious down a sea cliff and lands on the neck of the comatose Kraken. Meanwhile, as Armaggon attacks the confused and groggy Ray Fillet, Merdude awakes. The merman attacks Armaggon and short circuits the power belt around his waist – as it turns out, the belt was the device that Armaggon had used to travel through time, and Merdude’s attack has short circuited it. As Armaggon realizes what’s happened, he’s teleported away. Ray and Merdude make amends as Armaggon sits alone, trapped in a strange galaxy.